The all-natural gleeful grin gives it away, doesn’t it. Stephen Byron and Andrew Barr were smiling for the cameras too, but with Mr Byron preparing for one of the most intense periods of his career to date with the arrival of direct international flights this month and Mr Barr facing a gruelling election campaign from tomorrow, their smiles were not like that of the new Commissioner for International Engagement. There’s a reason for the difference. Former veteran Liberal MLA Mr Smyth will go to sleep tonight, as the ACT Government enters caretaker mode, knowing that for the first time in almost two decades he is set for a relaxed lead-up to the ACT Legislative Assembly elections. The former Member for Brindabella has run for public office in seven elections, two Federal and five local, over the past 21 years. We asked Mr Smyth this afternoon whether he was enjoying the prospect of the quiet campaign period ahead. 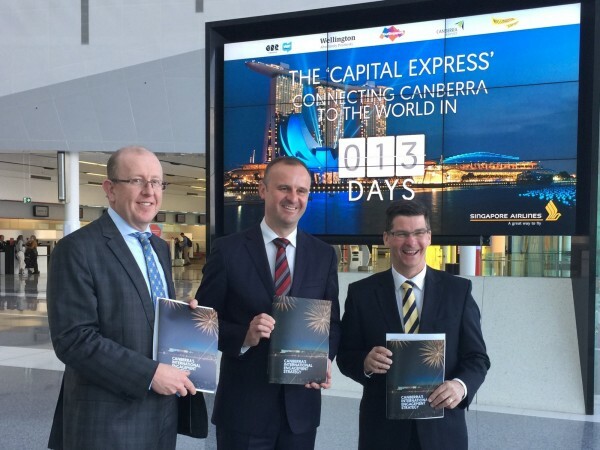 He was speaking, together with the Chief Minister and Airport managing director Stephen Byron, at an event to mark the launch of a document called Canberra’s International Engagement Strategy. Meanwhile, Mr Barr is preparing for 37 days of hard work selling his vision to Canberrans. His secret to surviving on the hustings? “I continue to exercise, obviously a key part of any stressful period is that you get a degree of physical activity together with all the mental stimulus that will undoubtedly come from the election campaign,” he said. Mr Byron is entering a busy period too, with the first regularly timetabled direct international flights scheduled to land at and take off from Canberra Airport in a matter of days. “I look at that screen that reminds me that we’ve got 13 days till our first flight, and that is going to be an enormously exciting event and occasion, and so there’s a lot of work going into the short term,” Mr Byron said. He noted there was also much work to be done towards long term goals such as daily international flights, the addition of new services into other parts of Asia and beyond and better business engagement between organisations in the ACT and internationally. * Recognise those lyrics from Sesame Street? “One of these things is not like the others” was written by Joe Raposo and Jon Stone (EMI Music Publishing).